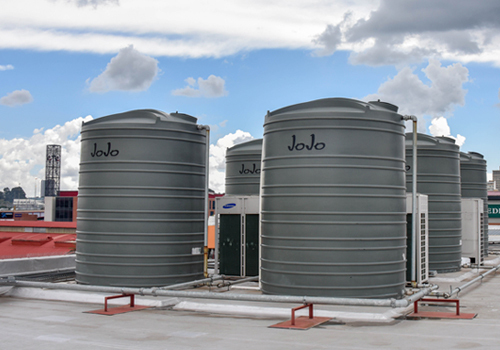 This system combines municipal water and rainwater for a full domestic supply. A combination of rainwater harvesting and municipal backup, our Fully Integrated System is the most sophisticated in the range. The tank is filled with a pre-determined level of municipal water that serves as a permanent backup, while offering the added benefit of harvesting rainwater. The water is then filtered, sterilised and utilised as a full domestic water supply. For more detail, refer to the Rainwater Harvesting Components section here. For more detail, refer to the Municipal Backup Components section here. To improve the quality of water in the tank. The water needs to be filtered and sterilised in order to be utilised for full domestic supply. Each installation will vary, based on the unique setup and your personal preference. We recommend using a plumber/professional installer, as the system needs to tie into the building’s main water supply line. Your rooftop should be cleaned regularly to avoid contamination of the runoff. Dust, leaves, animal excrement and dead insects accumulate on the roof during dry weather. It is therefore important to make sure that the roof is cleaned before the rainy season starts, followed by a monthly check to keep it clean. Ensure that branches overhanging the roof are regularly trimmed back. If any filters are installed before or after the pressure pump and/or water tank, please ensure that they are cleaned and/or replaced as per the installer and manufacturer recommendations. If a UV-light is installed, make sure to replace the globe as per the manufacturer recommendations. Tank size required for Fully Integrated System = rainwater harvesting calculation + municipal backup calculation. Size of tank = litres p/day x total days backup required. This will depend on available space, as well as access to suitable guttering/downpipes and the main incoming water supply line. Ensure that your tank is installed on a suitable base. The base must be sound, level, smooth, free of any protrusions and at least 100mm wider than the base of the tank (refer to pre-installation). Next, select your desired pre-filtration option(s). This will vary according to preference and the intended use of the water. Install your desired pre-filtration option(s). For detailed instructions, refer to steps 3 to 4 on the Rainwater Harvesting Installation section here. Cut a hole of 110.5mm in the middle of the lid and fit the pipe through the hole, stopping before it reaches the mesh/tank screen. For detailed instructions, refer to steps 2 to 5 on the Municipal Backup Installation section here. Install the desired filtration and sterilisation unit between the pump and the house.